Amethyst Group is a well established third party logistics supplier offering specialist services in consumer durables warehousing, distribution and e-fulfilment. Its headquarters are in Tunbridge Wells with a network of distribution centres in various locations across the UK. Amethyst is owned by the Itochu Corporation of Japan. Amethyst is the UK’s largest contract provider of warehousing and distribution services to the toy sector, delivering over £260million of toys annually. Recently Amethyst opened new offices and warehouse space in Wellesbourne, Warwickshire. The new warehousing added 20,000 pallets spaces and increased the company’s capacity at the site by 40%. We installed a narrow-aisle racking system in the new building and it follows the pitch of the roof to maximise storage space. 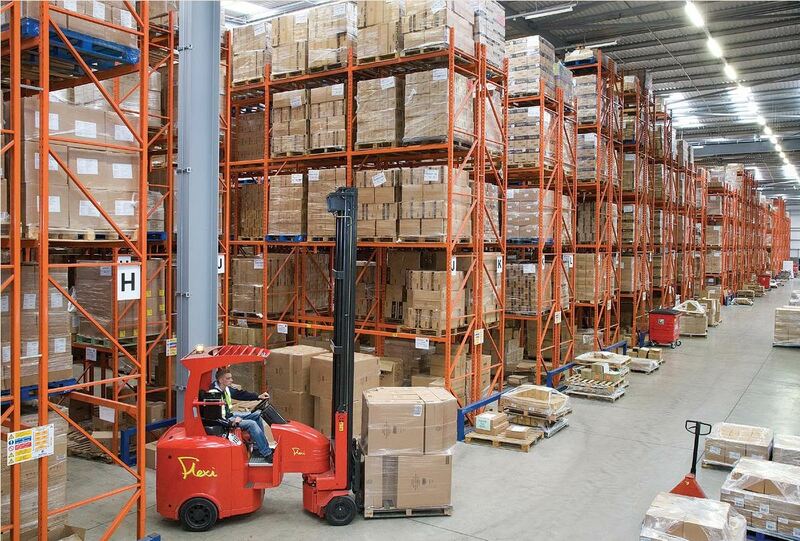 Aisles are just over two metres wide and nine Flexi reach trucks work within the system. The racking has seventeen double and two single runs, and a central gangway for access. Each run extends to over 50metres and has up to twenty-one 2.3m bays, each with either four or five beam levels. Pallets are stored two to a beam level. Column protectors guard the vulnerable end frames from forklift collision, and sacrificial legs enable fast replacement of any damaged accidentally.